Dr. J. Brent Copeland is an Anderson dentist who daily applies his extensive knowledge of cosmetic dentistry to give our patients smiles they have always wanted. Cosmetic dentistry creates a more aesthetically pleasing smile that you will feel confident showing off. Teeth Whitening – The food and drinks we consume take a toll on the appearance of our teeth. We offer in-office and take-home bleaching treatments to restore your pearly whites to a brighter shade. Each patient receives a mouth guard and a choice of formula concentration levels. Tooth Colored Fillings – When a tooth is decayed, the damaged portion must be removed and filled to function correctly and prevent you from being in pain. Traditionally, the composite for these fillings was silver amalgam, which are dark gray and often noticeable to others. 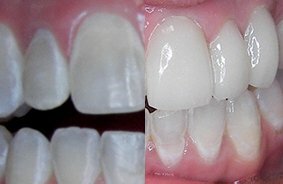 A more aesthetic option is composite material that is tooth-colored to blend in with your natural teeth..
Porcelain Crowns – This restoration involves placing a cap over teeth that are damaged and require more than a filling. Crowns provide a more natural and beautiful look while protecting the original tooth from further damage and decay. They typically are made of porcelain or ceramic to match the same shade of neighboring teeth for a natural look. Porcelain Veneers – A procedure where thin sheets of porcelain are bonded to your natural teeth to improve issues such as chipped, uneven, cracked or discolored teeth. This procedure is different from using crowns, in that there is less significant removal of the natural tooth structure. Veneers are custom-made shells that are created after an impression of your teeth is taken. Bridges – In the case of one or more missing teeth, dental bridges are used to replace the gap left behind. Traditionally, a crown or implant is placed on either side of the missing teeth, and will bridge the gap with porcelain or ceramic teeth placed in between. Enamel Reshaping – Cases where the tooth has become slightly crooked or irregularly shaped can be corrected as long as enough enamel is left for reshaping. Dr. Copeland can shorten, smooth, and alter teeth to create a more balanced smile. This is achieved by removing a thin amount of enamel to even the teeth. Reshaping enamel is not only an improvement of aesthetics but can correct mildly crooked/irregular teeth can cause bite problems and abnormal tooth wear. If you are unhappy with your smile and would like to learn more about how to achieve the stunning smile you’ve always wanted, contact us today. Dr. Copeland will explain each procedure and make recommendations on what he feels would best fit your needs. Dr. Copeland and staff are very nice and concerned with any and all anxiety that occurred during the visit.